The upcoming Christ for all Nations (CfaN) conference in April 2018, Light The Fire Again (LTFA) in Toronto, Canada will feature the leaders from some of the most powerful revival movements around the world. These historic meetings have one purpose: to rekindle the flames of revival that God has used for more than 20 years; to ignite a new generation with the fire of the Holy Spirit for the sake of the great end-time harvest. Christ for all Nations has seen one of the greatest moves of God in history. Since 1987, the organization has documented nearly 78 million decisions for Christ in its massive open-air campaigns in Africa and around the world. But in this season, Christ for all Nations is hosting a platform for new cooperation and cross-pollination between streams. Light The Fire Again is more than a conference; it is a solemn assembly (Joel 2:15) of pastors, worship leaders, teachers, evangelists and prophets from the Argentina Revival, the Toronto Blessing and the Brownsville Revival, as well as ministers from the intercessory, prophetic and missions movements who are coming together in one historic event. In his new book on the Holy Spirit, Holy Spirit: Are We Flammable or Fireproof, Bonnke says that "oneness does not mean sameness." Truly, the diversity of ministry gifts and movements represented in Light the Fire Again is startling (1 Cor. 12:4). 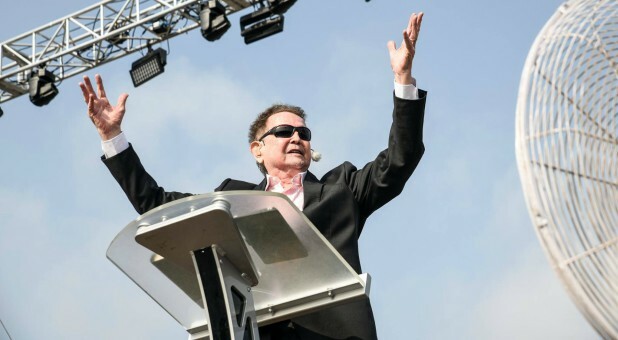 Evangelists Bonnke and Daniel Kolenda represent global evangelism and healing. Pastor John Kilpatrick, Lindell Cooley, Jeri Hill, Lila Terhune and Dr. Michael Brown bring their passion and fire birthed out of the Brownsville revival. Rick Joyner represents the Morningstar movement and adds his prophetic voice to the gathering and Claudio Freidzon brings the Argentina revival to us here in the North. There is definitely a new wind blowing across the body of Christ. Different streams of revival are coming together, partnering to see God's kingdom increase and looking for the next Great Awakening. If you have been praying and fasting for a move of God, you are in good company. Very few men are as passionate about prayer, intercession and revival as Lou Engle from The Call, and he will be part of Light The Fire Again, ministering and igniting a passion for prayer as only he can. Healing evangelist and missionary Heidi Baker brings fresh fire from the mission fields of Africa. As well, the host city will be represented. John Arnott and Randy Clark from the Toronto Blessing will be ministering there, in the very same building where the outpouring began in 1994! This is an historic conference that you will not want to miss. April 25-28, 2018 at the Attwell Center (site of the Toronto Blessing). Come and be part of a life-changing gathering of leaders from God's great global movements over the last 20 years. Join with us as we believe God to revive the flames of revival and see a mighty move of His Holy Spirit all over the earth, reviving the hearts of this generation. As Evangelist Daniel Kolenda declares, "The time is now for a new generation to experience the Fire. I believe we are standing on the threshold of the greatest outpouring of the Holy Spirit in history. The best is yet to come!"